This entry was posted in wonky arches and tagged architecture, mistakes, wonky arches on 10 August 2014 by James Alexander Cameron. This is brilliant, thanks for a good laugh on a Thursday! I was sent the link by a friend and have already brightened a colleague’s day by sending it on. Really nice work on the flaws in construction of some of these wonderful old churches. 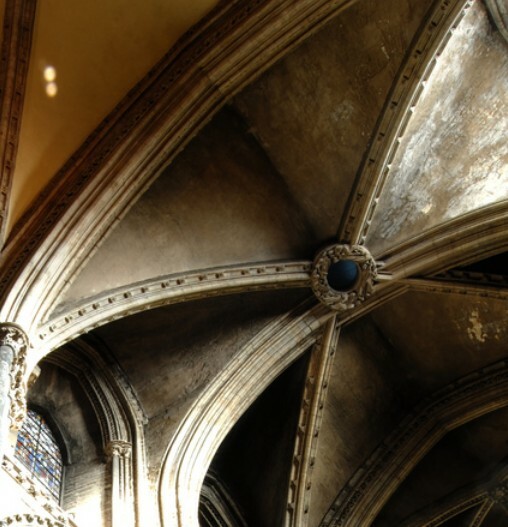 Remember having seen a ceiling in the York Minster with curves going up to the central boss that did not match up rightly. The ceiling of Linköping cathedral in Sweden is a bit wibbly-wobbly, although that could be down to the fire in the mid 16th century. Site foreman of St Mary’s and All Souls church, Chesterfield, Derbys.. Fantastic. 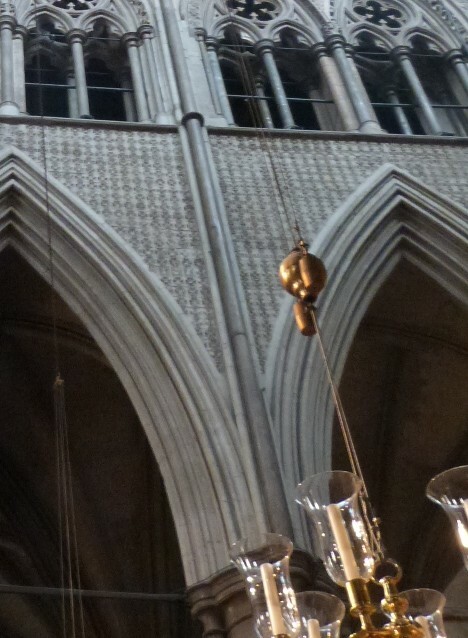 I had to look really hard tho on one and I’m not really sure about exactly what’s wrong with the presbytery spandrels? Can you explain to a non-expert please? I checked on google and wiki but all i got was explanations about medieval nappies. Yes, I apologise for the Abbey picture but then it’s very hard to get good pictures of it because of their rules. It is actually my picture from an after-hours visit when we were allowed to pretty much do what we wanted. Diaper just means covering (so I always think the Americanism is better than our silly “nappy”). It’s the square ornament with a flower in the middle that covers the arches. If you look closely you can just about see the design changes slightly and the grid of squares doesn’t line up. It would have been easier if I’d taken it from the gallery directly opposite but sadly I forgot. 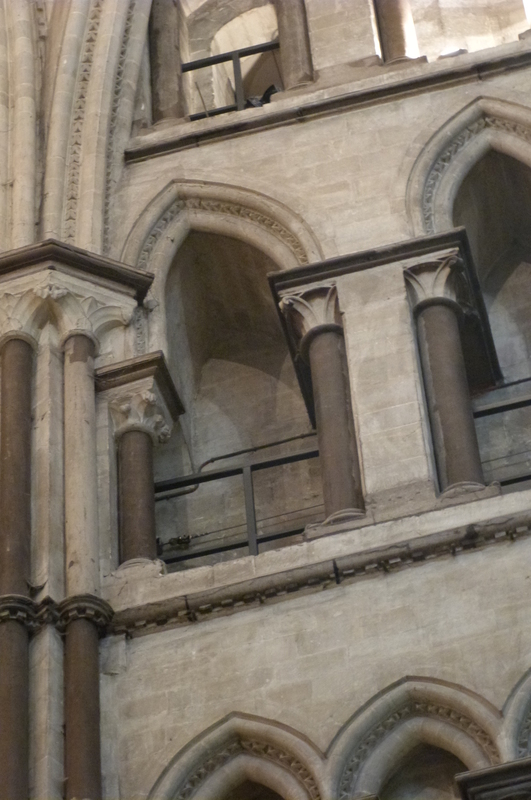 There are clearer pictures in Paul Binski’s Westminster Abbey and the Plantagenets, and it probably represents a building break and restart rather than a French architect’s exasperation at his English masons. 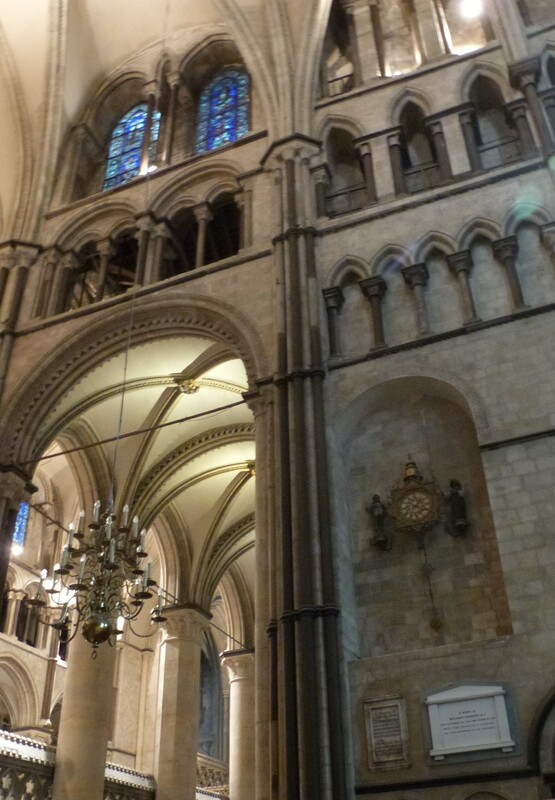 Some other explanations: William the Englishman replaced William of Sens at Canterbury when the latter fell off the scaffolding. The eastern transepts are entirely his, and look very different to what came before, and the famous “pilgrim” steps up to them actually cover up part of the earlier work which is rather amusing in itself. Salisbury isn’t built on top of an old cathedral like every other building here, although they possibly did keep the proportions of Old Sarum when they moved. The arch is actually a way of filling up the blank space caused by the fact the second storey is wider than the first. It is done a lot in East Anglian church arcades and probably wouldn’t be seen as a mistake. Durham really is a direct copy of Fountains they stuck on the end of the church, and they were really were stupid enough not to realise that the rib sprung from the body of the church wouldn’t line up with the new buttresses and would have to go diagonally and miss the cross-vaults. It is an absolutely epic mistake if you see it and it’s not easy to understand. The documented master mason of Westminster Abbey is Henry of Reyns. Whether he was from Rheims or not is one of the oldest debates in the literature. Clearly, he was. William Joy is the major architect at Wells in the first part of the fourteenth century who designs the Lady Chapel and retrochoir when the tower is recorded as enormiter deformitas (as far as we can make these assumptions about individual creativity in the Middle Ages), and it’s almost certain he made the decision to place strainer arches under the tower to stop it telescoping in. 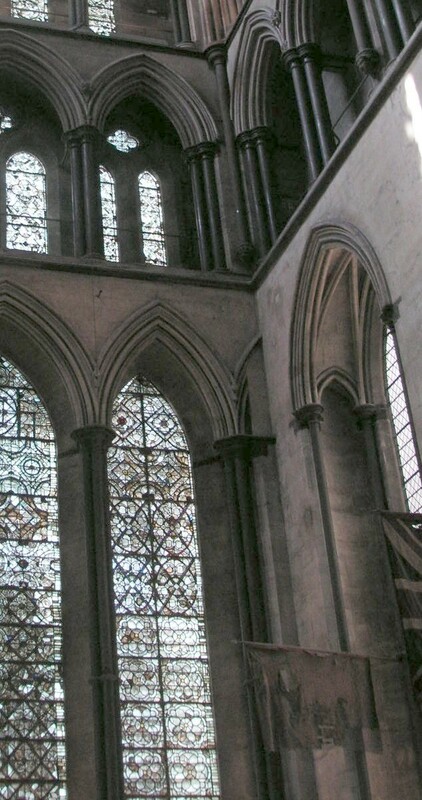 They are possibly a little over-sized and dominate the beautiful Gothic nave (possibly the first true Gothic in an English Cathedral, yes, before Canterbury) so I have no reservations to making you see a face in them forever more. Stand under them and look west instead! That really made me laugh!! 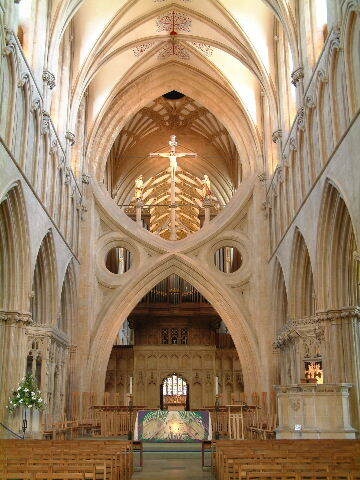 And, besides, I never knew that the arches in Wells cathedral had been built after the cathedral itself, thanks for this! Brilliant. Really laugh out loud. Love it. Got it as a share on FB and am sharing/following etc. I often use these ‘mistakes’ as a way in to discussing the aesthetics of medieval buildings: for example it is their more organic/less prescribed creative process that is one of the keys to the hard-to-define difference between, say, a really accurate C19 copy and the real thing. Do have a look at my own blog in case you like what you see there. Oh! Incidentally the Lady chapel at Wells is Thomas of Witney rather than the redoubtable Mr Joy. Personally I think WJ makes a fascinating case-in-point re the question of authorship in these buildings — I’d argue, arguably without much evidence to back me up, that he’s the first architect in English history with an absolutely identifiable personal signature style: does that reflect changing attitudes to ‘creative authorship’ in the C14? Discuss. Preferably at 3am after a drink or two. 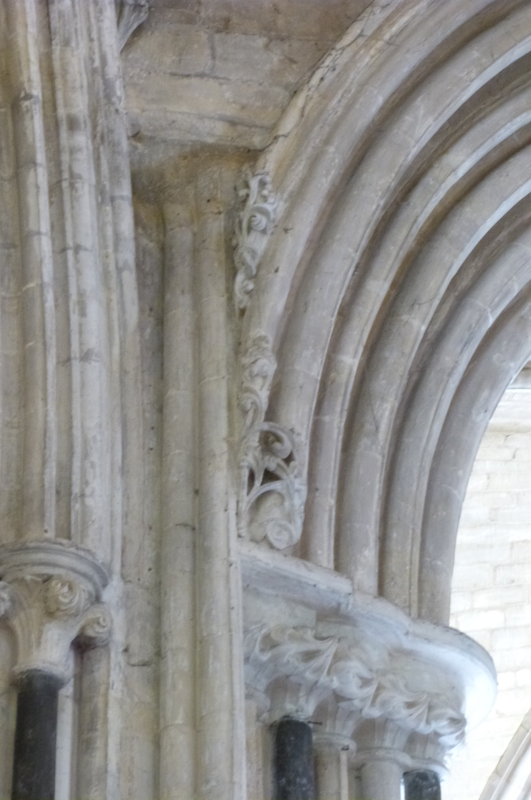 I confess I don’t know exactly how the strainer arches at Wells are documented! Sorry to be so po-faced. Anyway was doing more laughing than close reading, surely the general idea. Won’t go into the ins and outs of those strainer arches now, except that they’re probably 1340s and thus yes during time when WJ is at work at Wells, but the evidence is circumstantial — a recorded enormiter deformitas in the tower (or words to that effect) which may or may not be the problem they are designed to address. Stylistically they can really only be WJ or the controversial Bristol Master: if the latter they are presumably a few decades earlier. I know visitors often assume they’re an intervention of c1967 which shouldn’t have been allowed…. Good thing this would never happen nowadays. I also like the M.C. Esher-inspired triple arches in the south aisle at Tewkesbury Abbey, and Ely Cathedral’s south transept ‘offset doorway to oblivion’. I’m laughing way, way too hard at this post. Hilarious! Nice post — informative and entertaining. Have you got enough material to do another one? This just completely made my day! “The Normans did it” is now my new excuse for everything. Really liked this — especially the angry owls! Very witty! This has re4ally made my weekend! 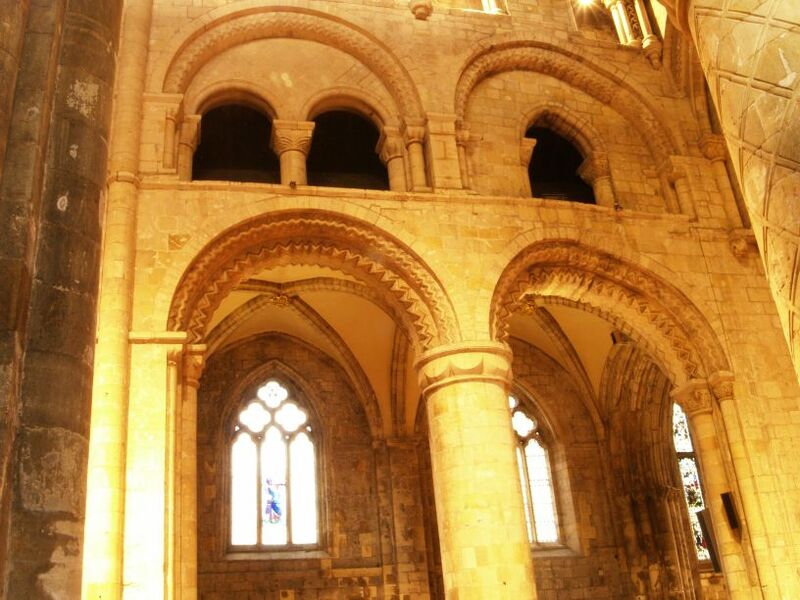 I’m slightly surprised you haven’t included anything from Ripon where there are some beautiful examples – pay us a visit here sometime and you’ll be rewarded. (There are some very intersting sedilia, too). Still not as funny as St Albans, though, which had the worst luck ever with bits falling down! Hard to get these across in single pictures though, I think. Have to think of another way. Ripon sedilia have truly extraordinary fourteenth-century sculpture though and have a section to themselves in my thesis! Fascinating that you had such problems at Westminster. In 2005 I spent two months doing a photo tour of 35 cathedrals and I was able to take photos there with – I think – a tripod. I was interested in the tourists being treated like sheep in One Man and His Dog with half a dozen groups in formation in the nave. But I see now that they have gone to a “No! No! No! unless you give us x hundred pounds” policy as used to be upheld by the National Trust, who used to lie about the powers they had to restrict photography under the law by misusing “hawking” law to apply to casual photography. So it comes down to JFDI (!) without a phallic camera which will give them palpitations, or in your place I’d find a reason why you need to compare Wabbey architecture to parish churches for your PhD, and they may let you in. I had no problems except for Durham who charged about £20 for a tripod license. Are you, btw, on the Yahoo Churchcrawling group? 2005 might have been the very end of photos in the Abbey. Certainly around 10-15 years ago they still had photo evenings (so I’ve heard). I got all my pictures when we went in after the British Archaeological Association conference in 2013 and could waltz around on the Cosmati pavement to our heart’s content ( https://flic.kr/p/fAF29F !). Otherwise they won’t let anyone take pictures of anything, basically guarding their copyright of their own image library. When I went to look at the sedilia I couldn’t take my own pictures, and I know people who’ve been there and had the same restrictions. I can understand Westminster’s general policy because as a tourist attraction it would be unbearable, but I think Durham are unreasonable and it really is a pain for me trying to remember precisely what things look like there (especially the Gothic bits) because there are so few pictures online. Never realised that this sort of thing had happened – always thought that these building were perfect! James, I keep noticing interesting sedilia you might want to be made aware of. Are you still at the ‘data gathering’ stage? Love the humour in it! I kept laughing as I read your work. I will never look at medieval architecture the same way again. on with different sized arcades.This difference is more obvious internally.Still my favourite building in all the land…. Great roundup. Makes me appreciate Ken Follet s Pillars of the Earth more. This is hilarious, I love your imagined conversations! I need to link this to all of my medievalist friends, they’ll love this!